The MassHealth Personal Care Attendant Program is converting from paper timesheets to the new MyTimesheet system. This new system is a mobile web based application, allowing hours to be input at any time and place via your mobile devices. The system is modeled on a time clock, where PCA's will "check in" on the mobile app when they begin work, and "check out" on the mobile app when they finish. Consumers will review and approve the hours. Once approved, the hours will be sent to the Fiscal Intermediary so that the PCA can be paid. The system will have added value for consumers as the app will allow them to manage their authorized hours more closely. MassHealth plans to begin a Pilot Program this summer, and use the feedback for a staged roll out beginning in January of 2018. As with all new online systems, until one is using it, it is difficult to predict the nuances and roadblocks. The Pilot Program will be key to filling in these gaps. Electronic Visit Verification is a requirement of the 21st Century Cures Act. Read the attachments below, or you can visit mass.gov/eohhs MyTimesheet webpage . MassHealth will conduct Public Listening Sessions. These sessions will include a program overview, and allow PCAs and Consumers to provide feedback on the program. These sessions will be held in June at several locations across Massachusetts. Download the PDF Listening Schedule june_2017_evv_listening.pdf. MassHealth has authored an extensive FAQ document (PDF) june_2017_evv_faq.pdf. MassHealth has provided an overview directed towards PCAs. Download the PDF document for PCAs masshealth_letter_for_pcas.pdf. Download the PDF document for Consumers masshealth_letter_for_consumers.pdf. Information for Consumer Surrogates: MassHealth has written an overview for Consumer Surrogates. Download the PDF document for Consumer Surrogates.masshealth_letter_for_surrogates.pdf. FYI: MassHealth has recently contracted with a third party administrator (TPA) (OPTUM of United Health Care) for multiple functions which were done in-house. November 23, 2016 After a rally, and extensive advocating, the PCA Overtime Coalition has successfully convinced the state to increase allowed PCA hours to 50. Please see the MassHealth flyer pc_overtime_november_2016.pdf and the state website for the specific ruling with details on exemptions and waivers. This new ruling is an important win for the disability community. Every action, rally, phone call, email and letter showed our strength when we all work together. And the results show how we can work with the administration! We need to continue to work together and with the administration as future proposals unfold. "Nothing about us without us! Unfortunately, Governor Baker and MassHealth have reacted to a Department of Labor ruling by eliminating overtime for PCAs beginning September 1. As of August 8, PCAs and consumers have not yet been informed. While on the surface, eliminating overtime sounds reasonable, instead this decision will play havoc with the ability of consumers to employ the people they need, when they need them. PCAs are not highly paid, and some rely on overtime just to make ends meet. The relationship between a consumer and a PCA is often very intimate and typically takes awhile to get right. In spite of PCAs' work being considered a low-skilled job, it is not easy for a consumer to find the right PCA. The intimate relationship creates a complexity that takes time to build. PCAs are not legos, easily replaced by another. At this time, in MA, it is difficult to find PCAs. 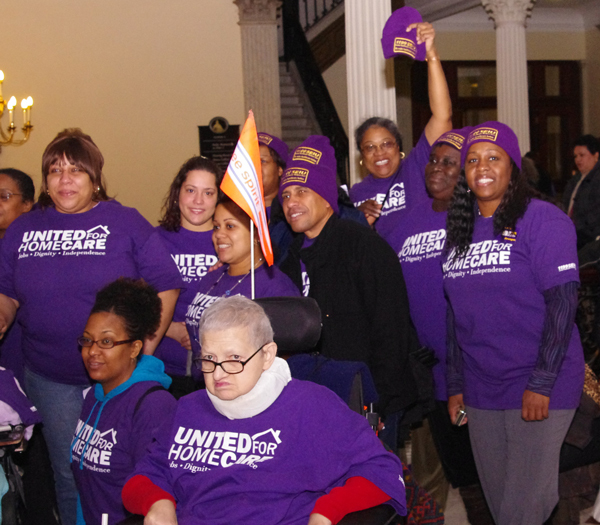 The work is not for everyone, and with a good economy, home care workers are in high demand. We predict that many many consumers will either be unable to find replacements in time. For some, this will lead to illness and/or institutionalization. Consumers must apply for exemptions, with the assumption that the exemption is not permanent. If a PCA lives with a consumer, the PCA may get approval to work up to 60 hours per week. This approval is for one year. Continuity of Care - Consumers may apply for mitigating circumstances and maintain their current PCA situation for 8 weeks. At that time, they may reapply for 12 more weeks. If you or someone you know is harmed by these new limits, please call Governor Baker and tell him your story, and how this ruling is affecting you. 617.725.4005 or visit ma.gov for contact information. PCA Referral Webinar - The PCA Workforce Council and Rewarding Work are hosting a webinar on how to use the PCA referral directory. PCA consumers / employers are encouraged to participate in to learn how to best use the features of the directory. We have implemented several new features since December. To sign up for the webinar on Wednesday, April 13, 2011 from 2-3:30 p.m., please contact Michelle Byrd at Michelle.Byrd@state.ma.us or 617 210-5715. We asked a PCA employer for her opinion on what is best and what is worst about the MA PCA program. Her response was the best part is that the program is consumer-directed (not the case in most states), and the worst part is that PCA's don't get health insurance. Most turnover can be attributed to PCA's finding other work where they get health insurance. 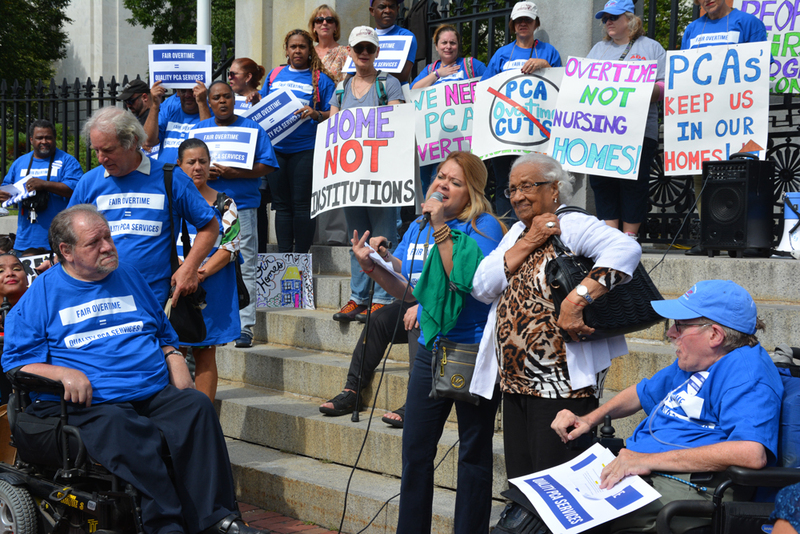 PCA Rally at the Statehouse - People with disabilities, Personal Care Attendants and Independent Living Advocates all gathered at the Statehouse in support of the MA PCA program. Bill Henning of BCIL spoke, as well as consumers, employers and PCA's. The crowd of about 150 attempted to speak to Governor Patrick, Speaker DeLeo and Senate President Therese Murray, but instead hope that the office staff relays the messages. January 19, 2011. The Center on Budget and Policy Priorities details budget cuts in 49 states (including MA) that have hurt vulnerable residents. With the current economy, and the new House rules (January 2011) stating all new expenditures need a comparable spending cut in the budget (and not a new fee or tax), these attacks on necessary services to disabled citizens will surely continue. Read this report by Nicholas Johnson, Phil Oliff and Erica Williams from November 5, 2010.